Life is a lot about perspective. 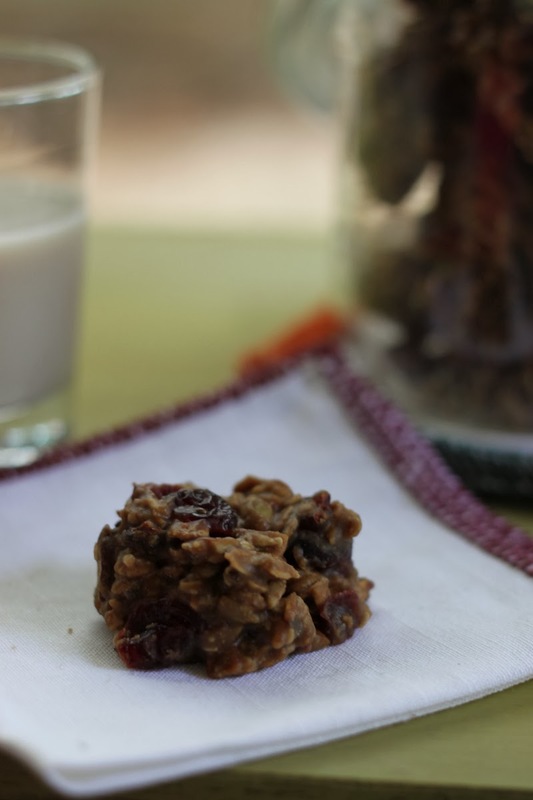 For example, I would call this recipe a praline - a sweet, almost candy cookie, but my husband keeps referring them as "breakfast cookies. You know I can always get behind dessert for breakfast - so I don't argue. No bake or boil cookies are my absolute favorite. I love that you can go from ingredients to cookies in about 20 minutes. The key is making sure the sugar-butter mixture boils for a full minute. Not tiny bubbles boil, full boil rolling boil or your cookies won't set. If you do have an issues with the cookies not setting, you can refrigerate the scoops and keep them stored in the fridge until you need one, for breakfast. Combine the granola, cranberries, almond butter and vanilla extract in a large bowl and set aside. Heat the brown sugar, milk, butter and salt together in a medium sauce pan over high heat. Bring to a boil and boil hard for 1 minute. 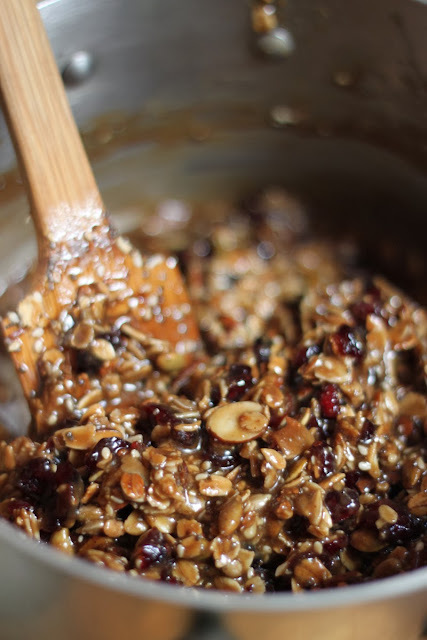 Remove from the heat and immediately add the granola mixture and stir to combine. Spoon the mixture out onto parchment paper in tablespoon spoon sized rounds. Cool completely before storing in an airtight container. Heat the oven to 300 degrees F. Lightly grease a half sheet pan with oil. In a large bowl, combine the oats, almond, coconut flake, oil, maple syrup, seeds, spices and salt. Spread the mixture into an even layer on the prepared sheet pan. Bake the granola for 60 minutes, stirring every 15 minutes, until the mixture is golden brown. Cool completely on a cooling rack before storing in an airtight container. Keep in a cool dark place for up 2 weeks. Oh my..me likes this down and dirty granola action..
Me too! 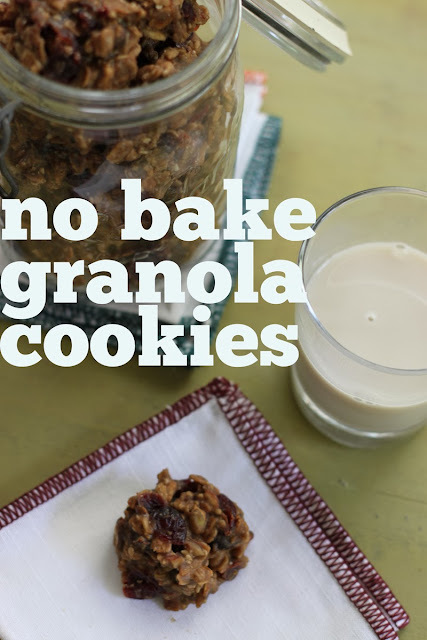 Who needs a fussy granola recipe, just throw that ish together! YUMMMMMMM. i love no bake cookies and cookies for breakfast? yes please! I seem to be having a "dessert" for breakfast month around here. I bet Matilda would love these. Thanks Sara - I'm so glad you stopped by. I love your husband's perspective. Funny how that word "breakfast" in front of cookie sure does justify the whole thing :) Im all in. Definitely trying the down and dirty granola! Girl - you should! 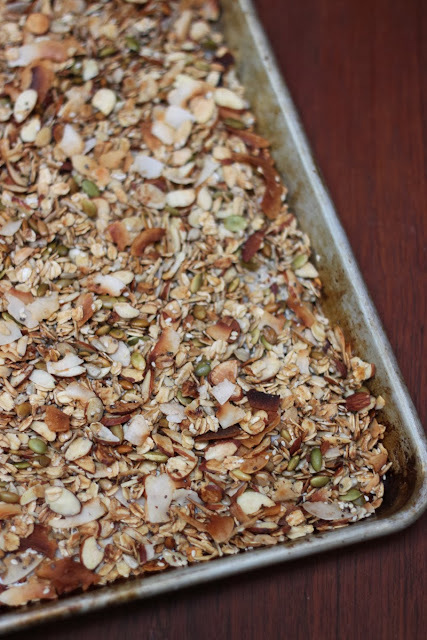 I'm borderline obsessed with coconut flakes in my granola right now.